Hey guys! It’s Ray back here and welcome to another blog post! Thanks to Nintendo, today I have an awesome opportunity to share with you guys both Bayonetta 1 and 2 for the Switch! How exciting is this!? Now if you’ve never played any of the Bayonetta games before. Boy are you in for a treat. These games are action-packed from start to finish…I’m not even joking from the second you launch the games you’ll see what I am talking about. One of the best things about the Switch version of the games is that if you’re trying to decide between getting Bayonetta 1 or Bayonetta 2, both games come together for $60 so effectively you’re getting Bayonetta 1 for $10 since 2 is $50 or each for $30 - no matter how you look at it, it’s a solid deal. Especially when you consider you’re basically getting double the Bayonetta sassiness - can’t go wrong with that! If you’re only are going to only play one of the two though, hands down Bayonetta 2 is a much better experience of the two. The first does have it’s tech issues with camera movement and stuff like that but with the second all of those issues have been ironed out. The graphics are absolutely gorgeous, the gameplay is much smoother and it also has a much easier learning curve. I’m not taking anything away from the first, I’m just stating the obvious that the second is easily better then the first so we’ll talk about that one for a bit. So obviously in these games you take control of the main character, Bayonetta, who is a strong and empowered shape shifting witch. In the cut scenes she is hella sassy and on the battlefield she is a force to be reckoned with. 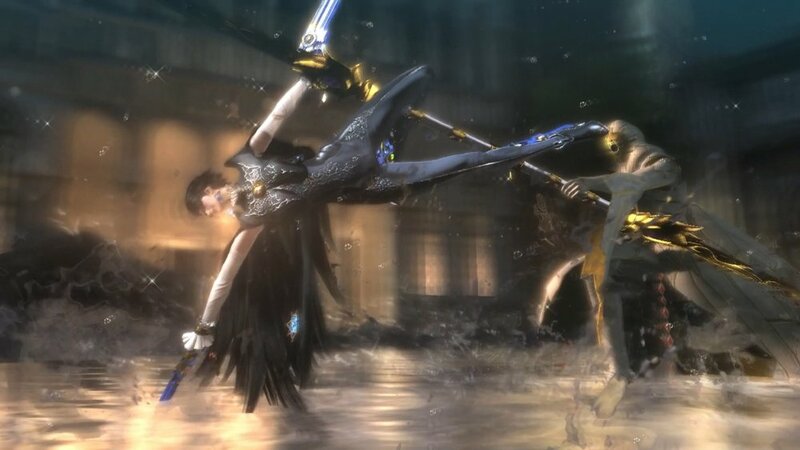 If you’ve ever played Devil May Cry or Ninja Gaiden games, the combat style in both Bayonetta games are very similar. The battles are fast and furious with combos flying everywhere and added mechanics like Witch Time and Torture Attacks make for some really intense and fluid action. The combat system is truly amazing. However, the action doesn’t just stop at the battles. It very translates over to the moments in between when you’re adventuring through the story mode. It’s not uncommon to have a city start crumbling leading up to a battle or a gigantic wave form to try to sweep you away. To speed things up and avoid these obstacles quickest, you can also transform into a panther to get around faster…Black Panther anyone? There’s no denying the fact that Bayonetta is a weird series full of ridiculous creatures and moments that will surely make you go what the f****. One second you’re fighting half man, half horse Accolades, the next the mighty Gomorrah, the next the gigantic Glamor. The battles are not easy either. I can confidently say that I died a few times at the ends of the Gomorrah and Glamor the first time I faced them. There is never a dull moment in this game because once you think you’ve just got done with a battle, another one is only a few steps away. That's what I love the most about Bayonetta games. They are literally cinematic masterpieces that feel like playable movies. They are more than just games, they are experiences. Overall, if you’ve ever played the original Bayonetta’s obviously, you’re going to love them here on the Switch. In fact, these games feel right at home on the Switch. Having the ability to play anytime, anywhere is really great and whether you play handheld or docked…the games simply look stunning. If you’ve never played any of the previous Bayonetta games, the Switch versions are the perfect place to start. I may even go as far to say that these are must-have titles for the Switch. Thank you, Nintendo for making this all possible and introducing me to these incredible games!